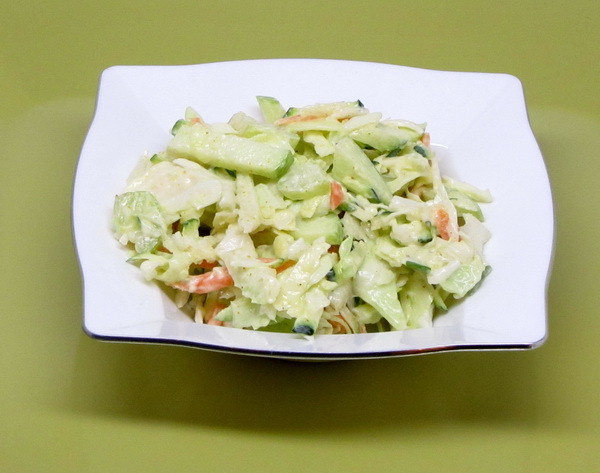 This is a great dinner or lunch side. 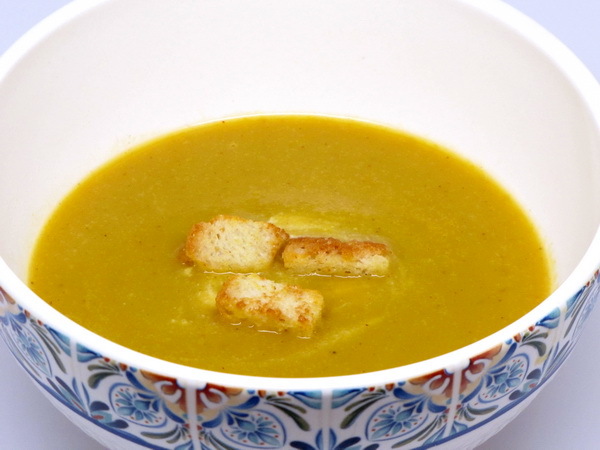 The curry and apples give it nice surprise flavor. Mix dressing and curry then add all the other ingredients and mix well. Cover and refrigerate several hours so flavors mingle well. My friend grows the tastiest cucs ! And they are just perfect in this salad. Just a bit of curry, just a bit of Tabasco, lotsa lime and great veggies. This is one you’ll make again and again. 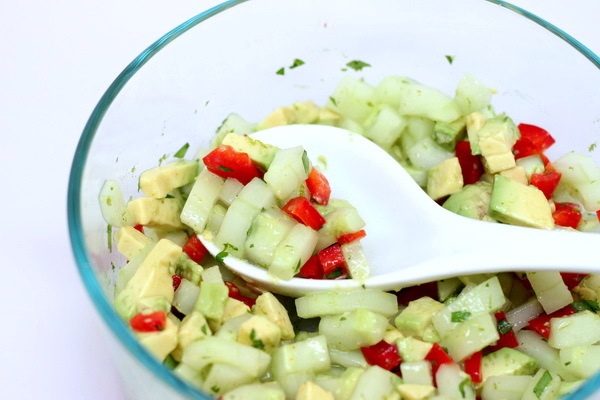 Take the cucumber pieces and sprinkle with salt and set in a colander to drain. This helps some to remove some of the bitterness that some cucumbers have. Mix pepper, lime zest, lime juice, cilantro, sugar and Tabasco. Pat the cucumbers dry and add to the pepper mix. Finally add the avocado and serve immediately. This was on of the most excellent lunch salads I have had in a long time ! The curry flavor is just divine, the meal is filling, and it will be a lunch to remember ! Bring broth to a boil. Cook chicken in broth 5 minutes or until cooked through and then remove to a plate and toss with 1 t curry. Bring broth back to boil and add couscous. Remove pan from heat, cover and let sit 5 minutes. Fluff couscous and place in a bowl with peppers, beans, scallions, and cilantro. Then add the mustard, remaining curry and salt. 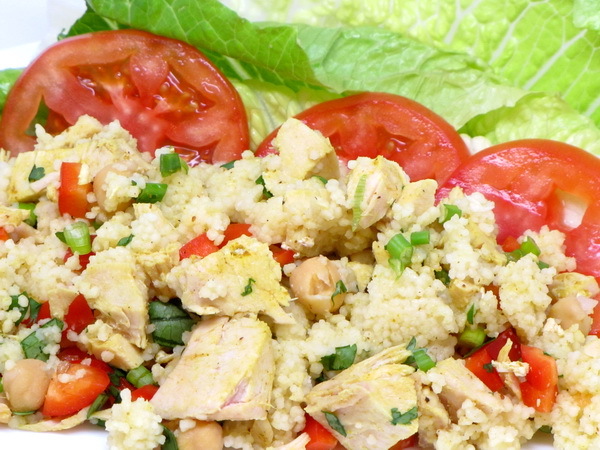 Put lettuce and tomato slices on plates and top with the chicken curry mix. Can be served cold or warm. This is an excellent quiche – no one would ever know you never even opened the oven ! The Swiss cheese is just perfect with the spinach and mushrooms. And the crust is so much more flavorful than a regular crust. You’ll definitely make this one again and again. Combine rice, ½ c cheese, ¼ c Egg Beaters and curry and press into the bottom of a 9” glass pie plate. Microwave 4 minutes or until firm. 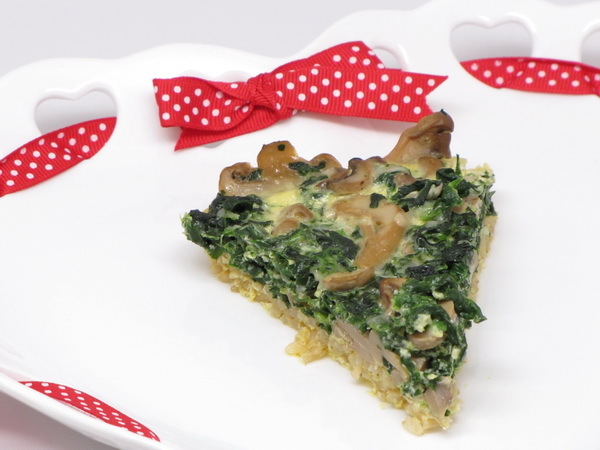 Combine spinach, milk, mushrooms, onion, spices, ½ c cheese and ½ c Egg Beaters and mix well then pour into the crust and microwave on 50% power 20 minutes (rotate it every 5 minutes or so if your microwave does not have a turntable) or until a knife inserted comes out clean. 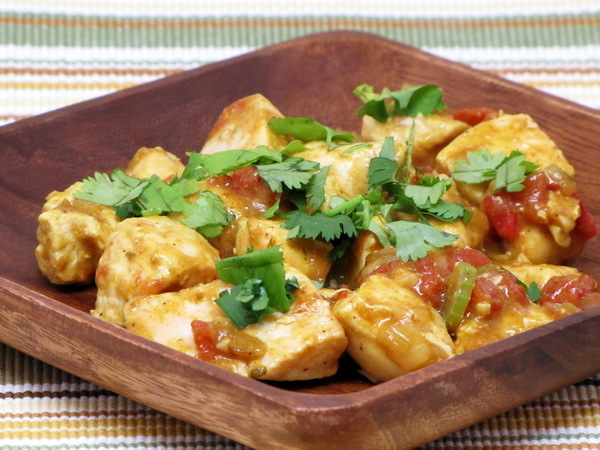 This steamy Indian inspired dish has just the right amount of curry. 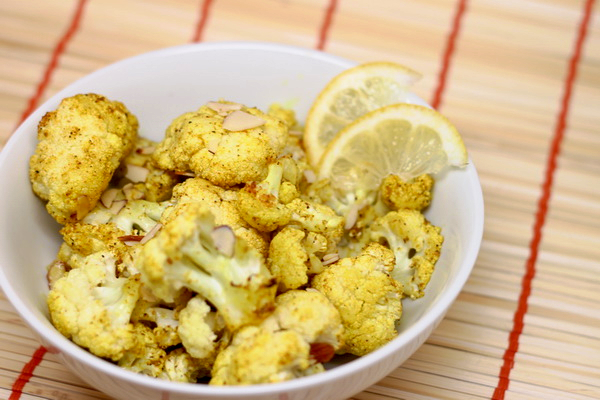 Pair it up with a vegetable side dish such as Ginger Steamed Carrots. Add salt and pepper to chicken cubes. Put 1 t oil in skillet and cook chicken 4-6 minutes or until browned. Lower the heat and cook 4 more minutes then remove from pan. Heat pan to medium and add oil, onion, celery and garlic. Cook 5 minutes. Stir in flour and add broth and cook 5 minutes or until thickened up. Stir in tomatoes, Worcestershire, curry and cayenne. Add chicken back to skillet along with salt and pepper and simmer 3 minutes. Remove and sprinkle with cilantro. The curry sauce in this dish is just perfect – very creamy and just enough of it. This makes a great professional tasting dinner and does not take long at all to put together. Cook rice in water according to package instructions. 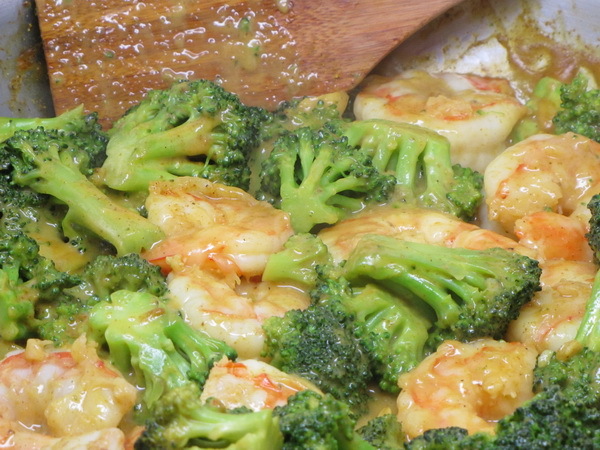 Heat oil in skillet and add garlic and cook 30 seconds then add broccoli, broth and curry and heat until simmering. Cover and continue cooking 8 minutes or until broccoli is starting to get tender. Mix milk, starch and salt and add to skillet. Bring to a boil and cook 2 minutes or until thickened, stirring constantly. Stir in lime juice and shrimp and cook until shrimp is done and all is heated through. Add salt and pepper. 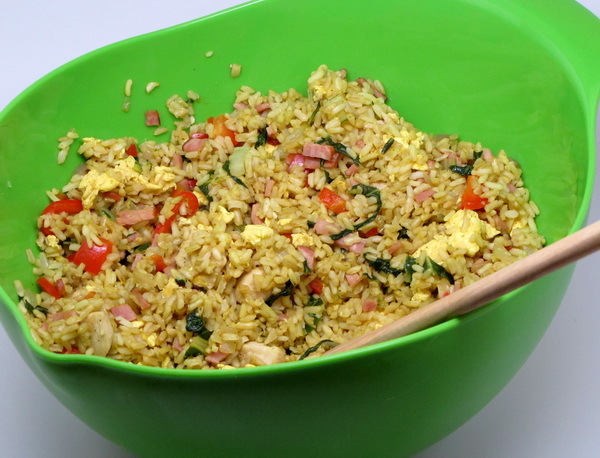 This version of fried rice is not your typical Chinese food fare. 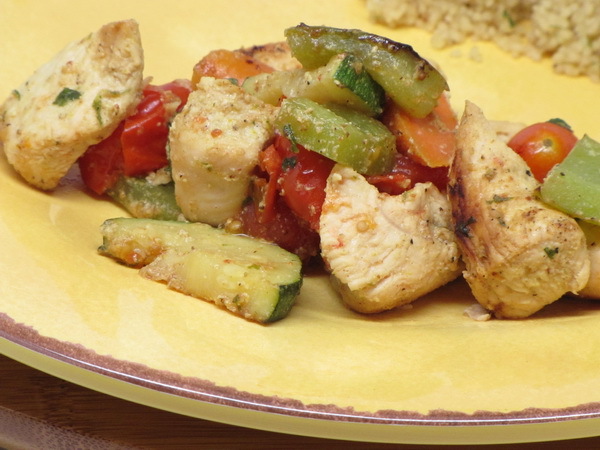 This is more of a Middle Eastern recipe and there are a wide range of BIG flavors in the recipe. But they mix well and become amazingly mellow. Heat 2 t oil in a large skillet on medium high heat and add onion and bacon. Cook 4 minutes and add bok choy and continue cooking another 2 minutes. Add pepper, ginger, garlic and cook until veggies are getting soft, about 5 minutes. Remove contents and set aside. Add 1 T oil of skillet and then cook chicken 5 minutes or until done. Set chicken aside. Spray skillet with Pam and when hot, add eggs and scramble. Add eggs to bowl with chicken. Add 1 T oil to skillet and cook curry powder 30 seconds and then add rice and cook without stirring until slightly crispy, about 4 minutes. Return all the other ingredients to the pan, add soy sauce, salt and pepper and heat 3 minutes.